She was born in 1968 in Napoli, she lives and works in Milano. 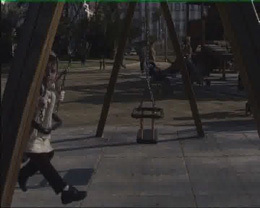 Like other works by the artist, this video catches up the viewer with an unusual and unforeseeable developing of the real from apparently simple and consequential starting conditions. In this case, we are firstly surprised by uncommonly seeing the artist paint a globe and then we can’t but wonder to see this latter become an ordinary soccer ball for foreign people. 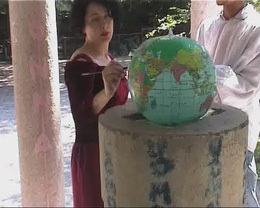 May we possibly see such an action of painting and covering geographical areas on the globe together with its transformation into a toy for foreigners as a gentle protest against racism? 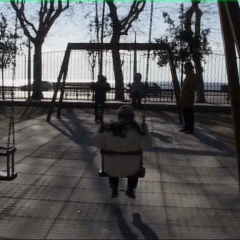 The swing belongs to the investigation area which is typical of the artist: the disenfranchisement of the reality that we would expect from the daily routine and rules. Once again, simple actions finally catalyse a redemption of what we’d suppose to be their logical ending: here we are suddenly and enormously surprised at the way our expectations literary break into fragments. 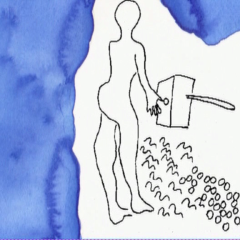 On a white background with watercolor streaks on the sides of the blue, you develop a very simplified cartoon scene, in which a human shape with a hammer reduces his fellow man to shreds, which they spread on the ground. 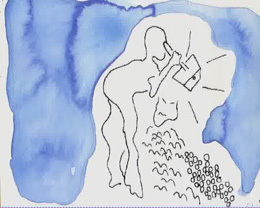 From this sprouts a flower and then it detaches a spherical that is collected and swallowed by another human figure, which finally approached them to the plane of the screen, then sends him shattered by a bite.